Finally the penultimate book 14 of this huge Guardians of Ga'hoole series, Exile. Although after reading 13 books at stretch anyone would definitely get bored and start asking when will this finish but Exile out of the blue still manages to captivate us readers in love and sadness with the brave owls of ga'hoole, the demonic Pure Ones, and the fight between good and evil. Few have been able to make a successful story of animals but this series exceeds that of an animal book,. Finally with the new book we can see the series with Soren and the band continue.Exile takes an even more darker twist in the Guardians of Ga'hoole when The Striga, a blue Dragon Owl who saved Soren's youngest daughter, Bell, and asked in return to stay and teach his ways to the owls of ga'hoole.It was their gravest mistake to agree this proposition. Slowly The Striga tries to inch closer in his friendship with the king of the tree: Coryn, as Coryn is even more slowly losing control over the Ember of Hoole's power. Even worse than that, books and ancient records detailing very early points in owl history, are being burnt, as a part of "cleansing from earthly possessions and vanity". The blue owl has one thing standing in his way from starting a cult: the band. As Soren, Gyflie, Digger, and Twilight figure out what is going on, poisoned by the Ember and Striga, Coryn sends a message to them as they are on their way home, banishing them, never to return to the Great Ga'hoole Tree, to stay in exile.But The Striga isn't done. Finding ways of accusing the owls of treason with hard evidence, The Striga orders that band is to be tracked down and imprisoned by their own friends of the tree . Hopeless the band separates hoping to meet again with allies to free Coryn from The Striga's spell.Kathryn Lasky again stumbles us with strange and dark secrets, keeps us pinned to the book in great fights, and warming our hearts with the courage and daring of the owls of ga'hoole. Exile gives us a view with the classic, good and evil, and the misuse of power and wisdom, that make a great story.I have to say though, I may have been slowly loosing interest in the series a little but the further into the series I go, the darker the books get, introducing things like references to cults, black magic, and demonic practices, but thankfully the author is able to keep a balance between the to facts of life with good and evil. After I read this book I thought that it was very well written, because when I read the title "Exile" I got confused and at the same time curious about what it is was about. As I read through it I started to understand it much more. This was one of my five top favorites out of the whole series. The other four where Legends Of Ga'hoole, Battle of the Ember, The Burning, and The Rescue. As I read each of these books so many thoughts about the story raced through my head. There are 15 books in total, sometimes when I think about when i read the books I wish that they would be one more story to the series a 16th book. Overall it was a great read and I hope someone takes interest in this. these books are getting weirder and weirder...a BLUE OWL named striga has gained control over coryn's mind making him EXILE the band as well as making owls burn their so-called "vanities". .........WHAT THE HGFGEUHFDHDSAHBGRUOFGMGDSDHHCDWAGYJHFMNXBXNCVHJSIEUGFYEJEBFGEJDBFHEHDFBFHDNDHFHSBCHFKWCJKJHBVSDHUIULNFHDBKUNHCKWHFBUWKHFKDFHWKJFHQUHEWBUHF!?!?!?!?!?!?!?!?!?!?!?!?!?!?!? This one was good. Rather dark I would say. The Striga is slowly taking over Coryn's mind. Tricking and deceiving him. As Striga has said, " at the heart is decite" now the band has been banished. It's the classic fight between good and evil. It questions power. And it begs the question, " Do we live under power or moral values?" I always enjoy the GoG'H books when the Band go off on their special adventures. It's always funny because they are such old friends they are always joking or squabbling with each other. In this book the Band and the other Guardians of the tree are invaded from the inside by the new owl who has recently taken up residents in the Great Tree. This evil owl grows closer and closer to Coryn and farther and farther away from reality. The young king is blinded by the new comers evil ways. And in the proses the evil owl does the unthinkable.... he burns books, owls and he banishes the band into exile. Can the Guardians and the Band defend them selves from such an evil owl whose forces are growing stronger by the day? Or will the six owl kingdoms fall into the fatal talons of the evil new-comer? JP Tulacka Guardians of Ga’ Hoole book 14 The Exile is a great book. I could hardly stop reading it was so suspenseful. The characters are the Soren Gylfie, Twilight and Digger which makes up the band. Outilisa a noble Spotted Owland and Coryn the King of the Kingdom. There also is The Striga who is an evil blue owl who came from the Middle Kingdoms and takes over Coryns mind. He convinces Coryn to send the band to go do weather research and once the band has left The Striga has the blue brigade (his secret society) come in and wait for the night of celebration so that they can take over the great tree and burn all of its vanities and rule the kingdoms. I liked this book because I have been a fan of the series for a while now and all of the books are excellent I think you should read it because it makes your imagination go wild. 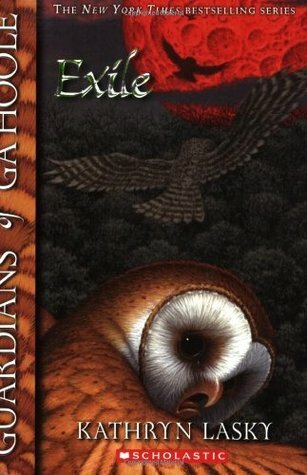 Guardians of Ga'Hoole: Exile (Guardians of Ga'Hoole Book 14) Summary: Slowly, inexorably, the Striga, a mysterious blue owl from the Middle Kingdom, gains control over young Coryn's mind. And then the unthinkable happens. The Band is banished from the Great Ga'Hoole Tree. The Striga instates a harsh new regime that will not stop until learning itself - the very foundation of the tree - becomes suspect and books are consigned to flame. Somehow the Band must open Coryn's eyes to the Striga's malign influence. But how? They are in exile!Rating: 3 starsOpening Line: "'All right, Otulissa, how does this sound for the lead article? '"Quote: "But, Cleve, I got this wound in battle. You are a gizzard-resister. I am a warrior. That is why we parted, remember?" Another totally awesome book in the Ga'Hoole series! Poor Coryn - led astray but yet another owl because he let his weakness of parentage get in the way of logic. The Striga is such a fool and it's sad that so many flew to his cause. I can't help but make the connections to our lives now, we have some jerk spouting ideas and too many people following him without really listening.Anyone, the Band and the rest of the tree have to get creative in order to save their livelihoods from the Striga.Book burning = blasphemous! Hope the Striga gets the stake in the final book!Also YAY/OUCH/AWE for Otulissa!This completes my reading goal of 175 books for 2014! Yay! Can't wait to finish this amazing series for the start of the new year! This time the story focus on the blue owl which is not so good. The blue owl create a cult and influence the king. The premise is like England witch hunt. How the king was influence, remind me of another chapter story in the book (i forgot which chapter). There is also a re-introduction of the owl previously introduce in the earlier chapter. At first, I found it hard reading the book because the blue owl really get into my nerve, but near the end where everything is starting to get better, I quite enjoy it. That's why I love this sage, each chapter has its own crisis and then the problem always get solved at the end of the chapter. In the penultimate entry of author Kathryn Lasky’s Guardians of Ga’Hoole saga, the Striga, a strange blue owl from the Middle Kingdoms, gains influence over King Coryn, with the Band led by his Uncle Soren exile from the Great Ga’Hoole Tree, and literature being set ablaze. The writer owes her gratitude to fellow writer Ray Bradbury for the dystopian world of his novel Fahrenheit 451, which has a similar depiction of the forbiddance of literature and learning, and the Striga plays a similar role to Grima Wormtongue in J.R.R. Tolkien’s Lord of the Rings trilogy. Aside from occasional defecation humor, this installment is on par with its predecessors, which is to say, good. Series Description:http://www.goodreads.com/review/show/...Book Description:Exile is the 14th book of the Guardians of Ga'Hoole series. There are elements in this book, like unexpected twists and references to other books with a similar plot that make this book very interesting. Since it has evil owls that burn books, it goes and refers to Fahrenheit 451 and Ray Bradbury in discreet ways that, since I read books like Fahrenheit 451, it makes this book unique to the other books in the series. I rated this book 4 star because I couldn't help but absolutely love a book in one of my favorite series, but at the same time the book was so horrible. I don't think anything good happened in it. (view spoiler)[And then in the last book, even though everything was fixed, Coryn died :( (hide spoiler)] Still a great book! This is without a doubt one of the most terrifying children's books I have ever read. It was almost painful to get through the book, but I knew I had to force myself to because there were only a few left in the series. This was probably my favourite book in the series. There's betrayal, gizzard-control, love, secrecy, and more. It was actually really good, not just fun, like the other books, but this was really good. Coryn discovers his true lineage and the Guardians of Ga'Hoole join the Greenowls of Ambala. It turns out, only Tengshu can be trusted from the Middle Kingdoms, while Orlando is rather troublesome. The question is: What has more power; the Striga or the Ember of Hoole? Another 5 stars from my 8-year-old. Exciting story. I like the Ray Bradbury twist on it. Evil is still around. How can it all end with just one more book? I thought this book was very good because it had very good details about the setting & what the owls were doing. I can't wait to read the last book in this series! the story in itself isn't that bad but it's just that we had this story twist already in one of the previous books. A grand finale to the Ga'Hoole series, lots of fun. Very fun read. I love Lasky's style of writing! Great story, interesting characters, and a strong plot. The blue 'hero' seems to be nothing but trouble.And when books begin to be burned the owls make plans to fight back. Not the best book in the world. Kathryn Lasky - Kathryn Lasky is the American author of many critically acclaimed books, including several Dear America books, several Royal Diaries books, 1984 Newbery Honor winning Sugaring Time, The Night Journey, and the Guardians of Ga'Hoole series. She was born June 24, 1944, and grew up in Indianapolis, Indiana, and is married to Christopher Knight, with whom she lives in Massachusetts.Book 15, The War of the Ember, is currently the last book in the Ga'Hoole series. The Rise of a Legend is the 16th book but is a prequel to the series. Lasky has also written Guide Book To The Great Tree and Lost Tales Of Ga'Hoole which are companion books.